One of the most interesting artifacts in Star Wars is that of the dark lightsaber (also known as the darksaber). 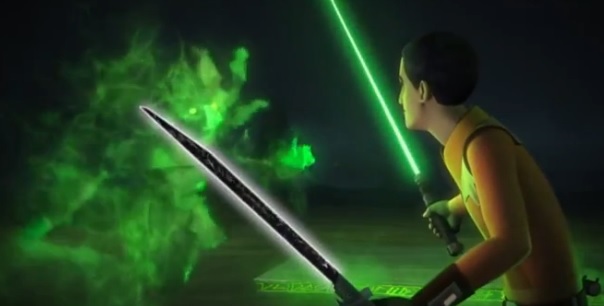 Appearing in several episodes of Star Wars: The Clone Wars, the darksaber was initially wielded by Pre Vizsla before coming into the possession of Darth Maul. Until recently, that was the last time the darksaber had appeared on-screen. However, with the darksaber appearing in a recent episode of Star Wars Rebels, there is more to the darksaber story to tell. 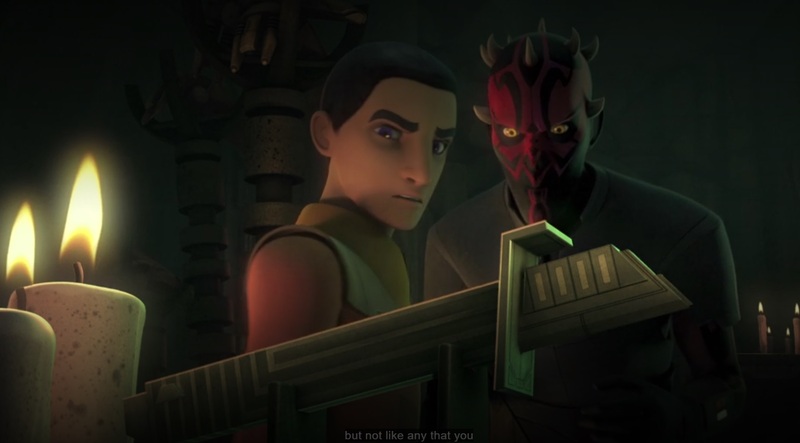 In the episode “Voices and Visions”, we see that Maul has the darksaber in his possession on Dathomir as part of a collection, as he tells Ezra Bridger, “These are artifacts from my past, from a time when my power was almost absolute.” When Ezra asks him “Is that a lightsaber?”, Maul responds “Indeed, yes, but not like any that you would know. 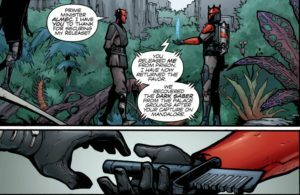 If your Mandalorian friend was here,” Maul laughs, then continues, “she could explain it to you.” This last line of Maul’s is certainly intriguing: Maul indicates that the Mandalorians have a special connection with this lightsaber. The question that naturally arises is “How does Maul have the darksaber, since the last time the darksaber appeared on-screen, it had fallen from his possession on Mandalore when he lost his fight against Darth Sidious?” The answer to this question is found in the comic, “Darth Maul: Son of Dathomir”, in which the darksaber is retrieved and returned to Maul, whereupon he fights numerous foes, such as Separatist droids, Jedi, and General Grievous. Curiously, in “Voices and Visions”, as well as the two previous appearances of Maul in Star Wars Rebels (“Twilight of the Apprentice” and “The Holocrons of Fate”), we do not see him wielding the darksaber. Why he does not use it fight goes unexplained, but there is probably a great story in there, waiting to be told (perhaps about an incident where Maul is talking to the Mandalorians and they either don’t respect his power anymore or don’t care much for his possession of the darksaber (or, perhaps, that his wielding the darksaber is less effective than a Mandalorian (especially from Clan Vizsla) wielding it)). 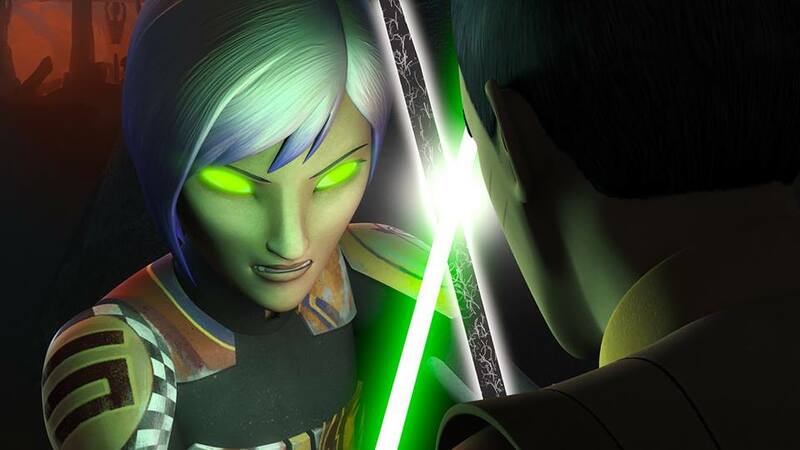 Once Sabine is free from the spirit, Ezra picks up the darksaber and returns to the cave to free Kanan. While he briefly fights Kanan in a lightsaber duel (although Ezra only uses his lightsaber and not the darksaber), he then challenges the Nightsisters. In the course of this happening, he turns on the darksaber and smashes their altar. In the resulting blast, the darksaber falls free from his land, landing on the floor of the cave. 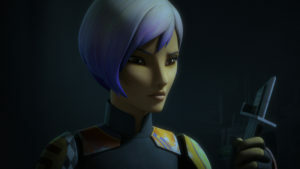 In the final moment of “Voices and Visions”, we see Sabine picking up the darksaber, and curiously eyeing it before taking it with her back to the ship. Now that it’s in the possession of Sabine Wren, it will be very curious to see what happens for the next episode of Star Wars Rebels, “Trials of the Darksaber”, in which we find out what happens next with the darksaber.